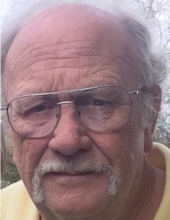 Paul Eugene “Gene” Bryant, 75, of South Portsmouth, passed away Monday, September 3, 2018, at Southern Ohio Medical Center in Portsmouth, Ohio. He was born May 15, 1943, in Scioto County, Ohio, a son of the late Owen and Nellie McLaughlin Bryant. Gene proudly served his country in the United States Air Force and was a member of the Vanceburg Church of God. He enjoyed watching Ohio State football and UK basketball, listening to ham radio and spending time with his family and friends. Gene is survived by his wife of 38 years, Patricia Evans Bryant; one daughter, Kassandra Bryant of South Portsmouth; and one sister, Betty Rowe of Sciotoville, Ohio. He also leaves many other family members and friends who will sadly miss him. In addition to his parents, he was preceded in death by one brother, Sheldon Bryant; and one nephew, Christopher Rowe. Services will be at 3:00 p.m. Friday, September 7, 2018, at Vanceburg Church of God with Bishop Eddie Stepp officiating. Burial will follow in Stone Cemetery. Friends may visit from 1:00 p.m. until the hour of services Friday, September 7, 2018, at Vanceburg Church of God. Pallbearers will be Joseph Evans, Joshua Kirschbaum, Samuel Bond, Daniel Bartee, Ezra “Tony” Bartee, Jim Evans and Cody Zornes.